Some people come to Cabo to sit on the beach and get a good tan. Others like to “do something” while here, and that often means taking a boat ride. For those who like to fish, deep sea fishing is a great option for doing something while in Cabo– it involves a boat ride and the thrill of the hunt. Anglers who come to Cabo San Lucas, Mexico, often specifically connect with Guerita Sportfishing to enjoy Marlin fishing from a well-equipped boat out on the gorgeous sea– check out the photos on here to see what you’ve been missing. Marlin are fast, athletic fish and they can grow to be so huge that it’s hard to fit you and them into one Facebook-worthy photo. They’re tough, too– imagine if a ballerina and a bull fighter got together and had a fish– so you’ve got one strong, acrobatic fish who can put up a great fight and really wow a crowd. Among fish, Marlin are legendary. So what are some Marlin fishing tips? Try getting them using artificial lures that splash and leave a trail. If you’re going to look for them near buoys or steep underwater ledges, you’re welcome to try live bait, which works well in areas where fish congregate. As for tackle, make sure it’s heavy enough to handle the intense pressure a Marlin will apply. Typically, reels at size 50 work well for this kind of fishing. If you want to find Marlin but you’re not sure where to look, then book a chartered boat with expert guides aboard who’ll lead you to the promised land (or would that be sea?! 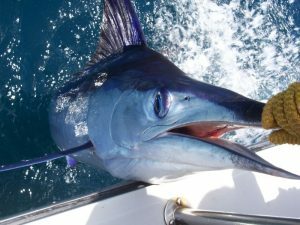 )… Navigating the Sea of Cortez or the Pacific side of Los Cabos, the captain and crew of Guerita Sportfishing know where the Marlin are and can take you there.